Each office is equipped with a blue recycling bin which is emptied weekly the overnight contractor cleaners. There is a shredding machine in the mail room (S0.01) for small amounts of shredding. For larger amounts please contact facilities-management@maths.ox.ac.uk who can provide a collection sack and take away the material for shredding. FM will also periodically announce a shredding collection. The department makes efforts to reuse items where possible or to make them available to others for reuse. In particular the majority of old IT equipment is made available for free to department members (via the collection point near S1.55), other university members or charities. As such very little IT equipment needs to be sent for recycling/disposal. As part of the move to the new building some furniture and other resources were reused. Other items were donated to the wider university and are now in use by other departments (you may recognise old maths items from Dartington House now in the Gibson Building as well as old maths items in use in those buildings by the new occupants that the department donated on departure). Recycling rates within the building are good. Our rates have risen from around 30% to over 60% and continue to climb. Other waste is also sent to generate power rather than go to landfill. There is a battery recycling collection point near the reception back office (S0.01). Printer toners are replaced by IT and gathered in the collecting box in the mail room. When the box is full FM arrange the collection and recycling. Please see the university policy on environmental sustainability. There is also information on the University Environmental Sustainability and Travel pages and University Environmental Sustainability Warpit scheme. The university has published a number of sustainability impact and opportunities reports which can also assist in purchasing decisions. The department/building displays its Energy Performance Certificate, Display Energy Certificate and the Building Research Establishment Environmental Assessment Methodology (BREEAM) Excellent Certificate in the entrance area of the building. 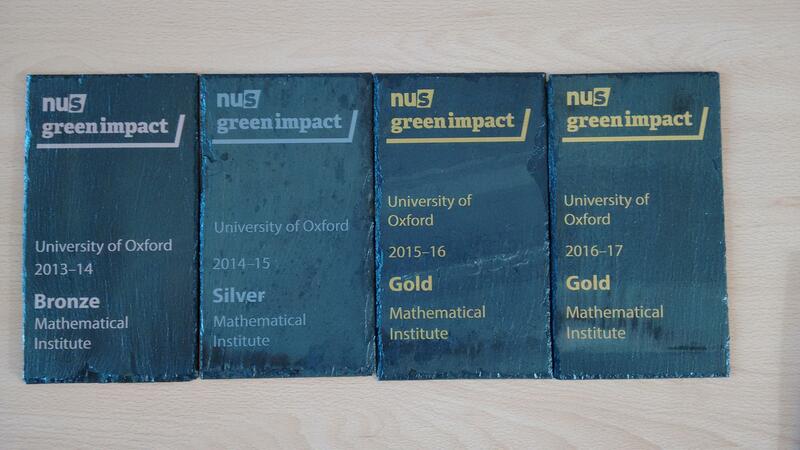 The department has participated in the University's Green Impact Scheme and Awards since they began in 2013/14. The department attained the bronze award in 2013/14 (i.e. based on the intial build without any further adjustment to operation or setup). In 2014/15 the department attained the silver award (note in both the first two years of the scheme gold awards were not part of the scoring/assessment system). In 2015/16 the department attained the gold award. We are very fortunate to occupy a new building and took a very active part in its design and implementation, in particular with the specification of practical and energy efficient systems. However, six key negative impacts our building and operations have are our electricity usage, gas usage, water usage, paper usage, travel to conferences, and travel of visitors to the department. The majority of the department's positive impacts are its efforts to reduce its impact (e.g. recycling, aircon management, green IT, duplex printing, video conferencing, equipment reuse, give away and recycling, annual full building inspections to identify issues, not using disposable crockery, cups and cutlery, natural ventilation, GSHP, BMS, recycling bins only, use of jet towel air dryers, no paper towels in wcs, percussion taps, filtered water zip taps for hot and cold water (rather than bottled water or bottle fed coolers or kettles), automatic lights off, insulation, green roof, TRVs, internal cycle store and showers, only running dishwashers when full, fairtrade, freedom food etc products through caterers, heating only on weekday working hours, logging of portable heaters issued (for temporary heating failures only), dual flush toilets, limited use of urinals and only with water management system fitted). The negative impacts above are periodically reviewed with the facilities management team. In particular we receive and discuss quarterly management reports within which we track the electricity, gas and water usage, and recycling and waste levels, as well as discussing ways to reduce usage further. Our paper usage is tracked both in terms of the amount ordered and various print and copy logs. Efforts continue to be made to reduce paper usage although we are currently only managing to keep usage constant (even though the number of people in the department continues to grow). At present we are using about 1.5 million sheets of A4 paper per year. We continue to see a slow rise in the number of people who use video conferencing rather than travelling to other places or coming here for short meetings and vivas etc. If you have other suggestions of things the department could consider for recycling and energy efficiency etc, or any other enquiries about Green Impact, then please email facilities-management@maths.ox.ac.uk or keith.gillow@maths.ox.ac.uk, or contact them in other ways (e.g. pop in for a chat). Please contact us for feedback and comments about this page. Last update on 19 October 2017 - 11:05.